Among many things, Chimera examines the controversial topic of stem cell research exploring the horrors of humanity, body farming and the extent a father will go to save his children. Chimera is a dark, controversial, heartbreaking and terrifying concept to absorb. A well rounded small cast including veteran actors Henry Ian Cusick, Kathleen Quinlan and the beautiful Jenna Harrison and Karishma Ahluwalia give good performances with deep material. Newcomer Erika Ervin stands tall above the rest of the cast, literally at six foot eight inches, delivering another intriguing role from a beautiful lady. First time writer and director Maurice Haeems shoots a professional looking feature, creating a layered story that tackles controversial subject matter. 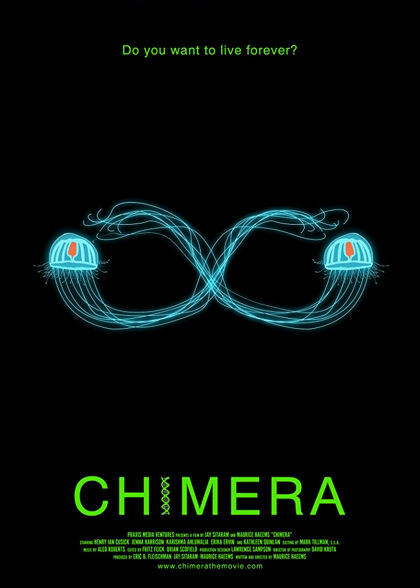 Chimera takes you on a journey with his indirect storytelling, piecing together a plot that’s worth sticking around until the shocking end for. A feature film that’s primarily scientific explanations, most often told through voice-overs while you watch the scientist work isn’t viewer friendly. There’s a lot of good to find beneath Chimera's microscope. Its potential just doesn’t hold up to the level of execution of the narrative.